Decorate! Our tween daughters enjoy decorating for any holiday and St. Patrick’s Day is no different. We handed over the decorations to the tweens and let them have fun with it. 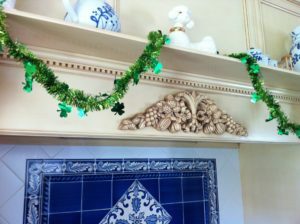 The picture above is of Katherine’s kitchen decorated with green shamrock garland! 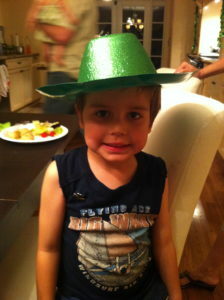 Decorations don’t have to just hang from the walls…green, glittery cowboy hats became the hit of the party! Our one and only tween boy Jonathan showed off the look. 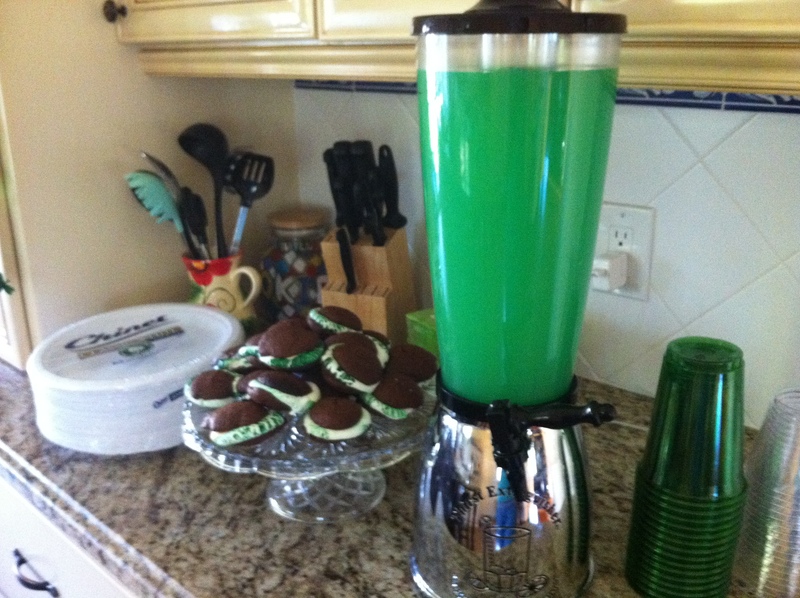 Rockin Shamrock punch had to make an appearance at the party! Fun green punches and drinks are a great alternative to the sodas or juice boxes. 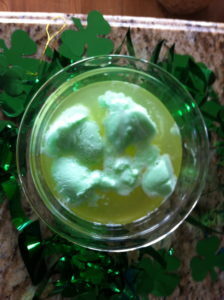 Click here for the Rockin Shamrock recipe. Green lemonade, anyone? A little food coloring in the lemonade made this drink fun. To go with it – chocolate marshmallow fluff sammies with green sprinkles! 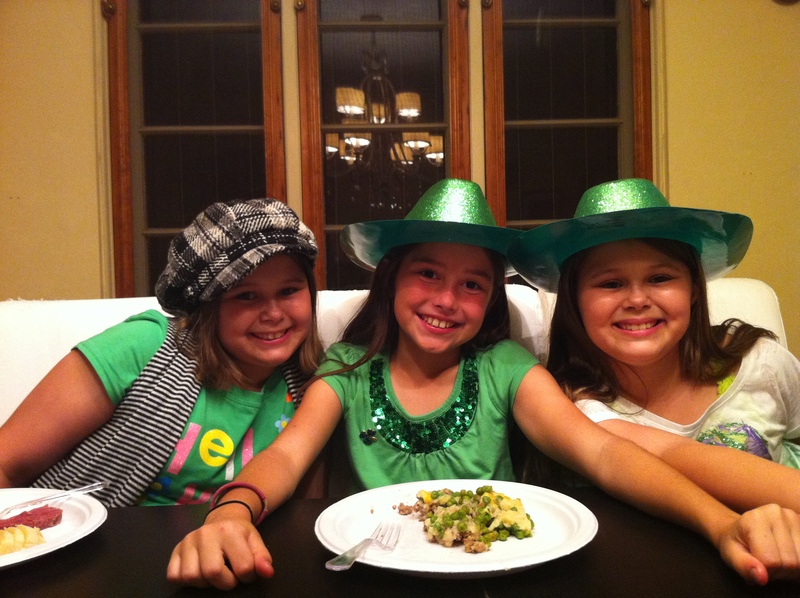 Our St. Patrick’s Day menu included Corned Beef and Cabbage and Shephard’s Pie. Turns out some of our tweens aren’t potato fans. Note to self for this year: offer a pasta alternative maybe with a green pesto? While tweens can be a hard crowd to plan entertainment for, we decided to let them figure it out on their own and they did. They talked, played flashlight tag in the yard and just hung out with each other which gave the parents time to catch up and relax. 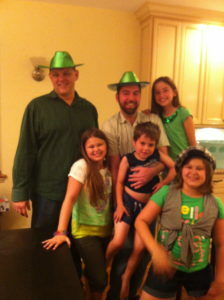 Even if you’re not Irish, St. Patrick’s day is an event that allows us to immerse ourselves in another culture. Make it a day of learning and fun. Happy St. Patrick’s Day, Amigos! This entry was posted in Culture, Recipes and tagged Parenting, St. Patrick's Day, Tween Friendly Party, Tweens. Bookmark the permalink. purifier using it. As a dog owner you know how unpredictable dog odor can be.